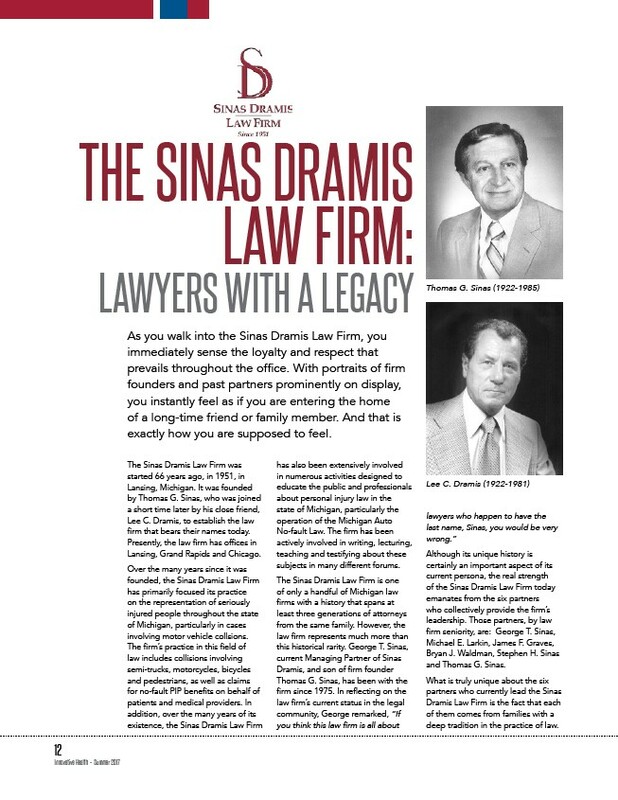 12 THE SINAS DRAMIS LAWYERS WITH A LEGACY Thomas G. Sinas (1922-1985) Innovative Health - Summer 2017 LAW FIRM: As you walk into the Sinas Dramis Law Firm, you immediately sense the loyalty and respect that prevails throughout the office. With portraits of firm founders and past partners prominently on display, you instantly feel as if you are entering the home of a long-time friend or family member. And that is exactly how you are supposed to feel. Lee C. Dramis (1922-1981) The Sinas Dramis Law Firm was started 66 years ago, in 1951, in Lansing, Michigan. It was founded by Thomas G. Sinas, who was joined a short time later by his close friend, Lee C. Dramis, to establish the law firm that bears their names today. Presently, the law firm has offices in Lansing, Grand Rapids and Chicago. Over the many years since it was founded, the Sinas Dramis Law Firm has primarily focused its practice on the representation of seriously injured people throughout the state of Michigan, particularly in cases involving motor vehicle collsions. The firm’s practice in this field of law includes collisions involving semi-trucks, motorcycles, bicycles and pedestrians, as well as claims for no-fault PIP benefits on behalf of patients and medical providers. In addition, over the many years of its existence, the Sinas Dramis Law Firm has also been extensively involved in numerous activities designed to educate the public and professionals about personal injury law in the state of Michigan, particularly the operation of the Michigan Auto No-fault Law. The firm has been actively involved in writing, lecturing, teaching and testifying about these subjects in many different forums. The Sinas Dramis Law Firm is one of only a handful of Michigan law firms with a history that spans at least three generations of attorneys from the same family. However, the law firm represents much more than this historical rarity. George T. Sinas, current Managing Partner of Sinas Dramis, and son of firm founder Thomas G. Sinas, has been with the firm since 1975. In reflecting on the law firm’s current status in the legal community, George remarked, “If you think this law firm is all about lawyers who happen to have the last name, Sinas, you would be very wrong.” Although its unique history is certainly an important aspect of its current persona, the real strength of the Sinas Dramis Law Firm today emanates from the six partners who collectively provide the firm’s leadership. Those partners, by law firm seniority, are: George T. Sinas, Michael E. Larkin, James F. Graves, Bryan J. Waldman, Stephen H. Sinas and Thomas G. Sinas. What is truly unique about the six partners who currently lead the Sinas Dramis Law Firm is the fact that each of them comes from families with a deep tradition in the practice of law.